Granted, I'll wait 5 years when competition kicks in and the price drops a bit an an altitude above 6000'. Though,, they do need to work on the stability issue. A passenger drone, it’s a VTOL aircraft that’s designed to serve as an alternative to helicopters, so you can hop from spot to spot while riding a whisper-quiet aircraft. The good news? You can actually use it to fly between different cities and, perhaps, state-to-state. The bad news? It has a maximum range of just 70 miles, so it will cover way less distance than traditional choppers, leaving it unsuitable as a full-time replacement, unless you’re willing to make multiple stops to hook up to a power outlet. Like their pickup truck, the Workhorse SureFly runs on a hybrid design that combines electric motors and a gas piston engine. Eight electric motors running a propeller each allow it to take flight and cruise along the skies, while the gas engine charges the battery system whenever juice starts running low. 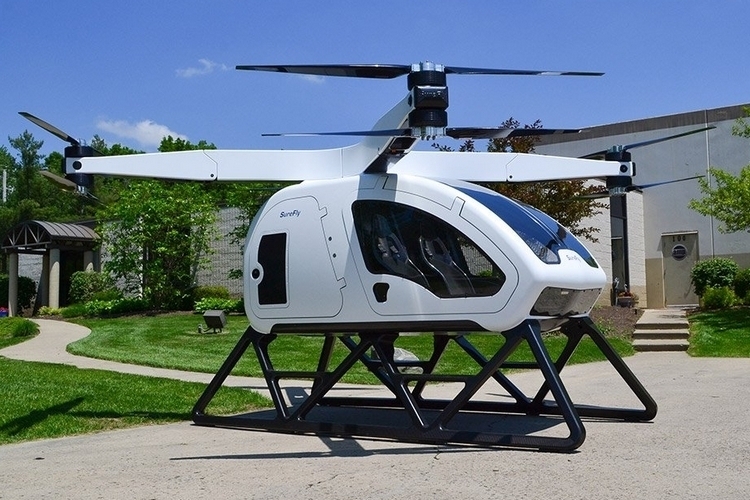 That combo allows it reach altitudes of 4,000 feet, all while cruising at speeds of up to 70 mph, so it’s not that much slower compared to commercial helicopters, which typically fly at speeds of 80 to 100 mph. For safety, all the electric motors and propellers operate independently, ensuring one can malfunction without affecting any of the other pairings, so the drone will keep on running even with multiple failed motors. It also comes with a redundant battery system that puts a backup always on the ready, with a ballistic parachute ready to deploy and land the drone safely in case of any emergencies. And, yes, even the computer system is redundant, so they really worked on everything that can possibly go wrong during flight.